Pollution • Prohibition aimed to help clean the air would extend from November to March. 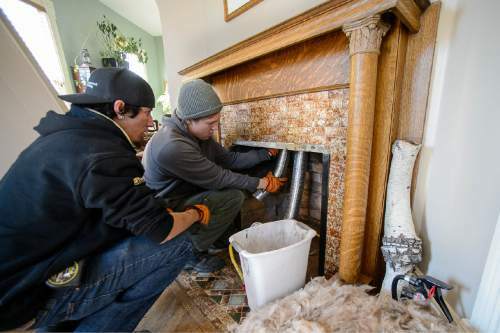 Trent Nelson | The Salt Lake Tribune Ben Loya and Tyler Marquardt install a gas fireplace at a home in Salt Lake City, Tuesday November 11, 2014. Gov. Gary Herbert has proposed banning the use of all wood-burning devices to help improve air quality. Just as another inversion season sets in, Utah Gov. Gary Herbert has come forward with a proposal that is sure to inflame the debate over how to alleviate the Wasatch Front&apos;s wintertime air pollution  ban the use of wood-burning devices. Not just during inversions, when tiny particles concentrate in the valleys, but every day from November to March. The Utah Air Quality Board on Wednesday voted to explore the idea, thus opening a public comment period on Jan. 1. Hearings will be held in each of the seven northern Utah counties affected by the proposed ban. "Through the public process and research we can come up with a sound and workable policy," said Alan Matheson, the governor&apos;s environmental policy adviser. "We are serious about cleaning up the air and recognizing the hazards of wood smoke. We need to emphasize public health over ambiance." Wood smoke has been implicated as a contributor to the fine particulate, or PM2.5, that degrades Wasatch Front air quality, although it pales in comparison to emissions from automobiles and industrial sources. Still, the governor&apos;s air quality task force sees wood as "low-hanging fruit" that can yield big air quality benefits if burning is reduced. "I&apos;m really excited about this. I can&apos;t wait to hear the public feedback," said board member Erin Mendenhall, a Salt Lake City Council member and policy director of Breathe Utah. "There is a need for robust discussion around this." Board members stressed there should be an educational component to the ban, including signage at the stores that sell bundles of firewood. Also Wednesday, however, the board voted to re-open the registry of homes that rely solely on wood for heat. Mendenhall was troubled by the move, since it increases the number of residents exempted from wood-burning restrictions. DAQ officials believe a ban on wood burning could knock nearly 2 micrograms off the valley&apos;s worst PM2.5 readings recorded at the monitoring station at Hawthorne Elementary School  approximately a 4 percent reduction. Modeling shows this gain can be achieved if compliance with no-burn rules increases from 85 percent to 100 percent, according Dave McNeill, DAQ&apos;s planning manager. "If everyone with a wood stove did burn, the air quality would be a mess," he said. Burning is currently banned as inversions set in and particulate concentrations approach and exceed health standards. While clean air activists welcome the governor&apos;s idea, others argued a full ban would do more harm than good by punishing those who invested in newer, cleaner-burning wood stoves. The stove industry has invested heavily in improving the efficiency and reducing emission from its products, industry representatives say. As an alternative to a full ban, the Hearth, Patio & Barbecue Association urges a two-stage ban that is more restrictive on older, more-polluting stoves. "It would be good to encourage upgrading to cleaner technology, allowing some carrot instead of all stick to reduce emissions related to wood burning," said Utah wholesaler John Mortensen, who owns Energy Distribution Systems. "An open fireplace emits 20 times more than an EPA-compliant stove. If you stick an insert into a fireplace you have cut its emissions by 95 percent. That makes more sense than an all out ban." Regulators contend a total ban would be much easier to enforce, a claim the hearth association disputes. "Addressing the air quality challenge is going to take sacrifice from all of us," Matheson said. "Any strategy is going to have impacts on somebody." One activist urged the board to increase wood burning restrictions not just because the burning adds particulate into the sky, but because the smoke is laden with other harmful agents that put it on par with cigarettes, which are no longer permitted to be smoked in public places. "There are unique chemical and biological elements in wood smoke that make it the most toxic form of community pollution," said Brian Moench of Utah Physicians for a Healthy Environment. "Wood smoke in a community area does not disperse well. It penetrates easily into a person&apos;s home."